April 28, in Ankara, the panel discussion "Khan's Palace: Yesterday, Today, Tomorrow (?)" was held, organized by the Association of Culture and Mutual Aid of the Crimean Tatars in Turkey. 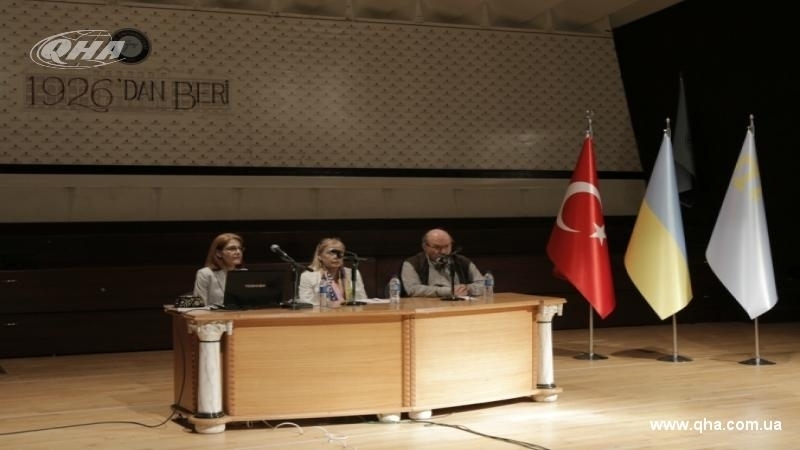 Professor of the Trakya University Engin Beksach, architect Alie Ibrahimova, historian Nicole Kanchal-Ferrari, candidate of technical sciences Anatoly Antonyuk took part in the discussion. The Head of the Association for Culture and Mutual Aid of the Crimean Tatars, Mukremin Sahin, recalled that the Crimea has been under Russian occupation for four years already. "Destruction under the guise of restoring our historical heritage - the Khan's Palace, best reflects the situation in which the Crimea found itself," said Mukremin Shahin and added that under the guise of restoration in the occupied peninsula, the cultural heritage of the Crimean Tatars is being destroyed. Professor of the University of Trakya Engin Beksach called the Khan Palace is a monument of the cultural heritage of mankind. “The Khan's Palace belongs to the Crimean Tatars. It is a symbol of the Crimean Tatars in the Turkic world. As a scholar, I am firmly against this restoration," Beksach stated. Historian Nicole Kanchal-Ferrari noted that the Khan's Palace was the administrative center of the Crimean Khanate. Most parts of the Khan's Palace was destroyed by the Russian Empire in the 1700s, and the modern Khan's Palace was built in the 1800s. The palace is an example of the national identity of the Crimean Tatars and a monument of the cultural heritage of mankind. "We must be very sensitive to this issue," Kanchal-Ferrari said. Candidate of Technical Sciences Anatoly Antonyuk said that for 30 years he has been engaged in the restoration of architectural monuments damaged by military actions. "Because of annexation, we are close to losing the unique relic of the Crimea, its genetic code and culture," said Antonyuk. Earlier, the Chairman of the Mejlis of the Crimean Tatar people, People's Deputy of Ukraine Refat Chubarov at the parliamentary hearings on "The State, Problems and Perspectives of Protection of Cultural Heritage in Ukraine" called for the prosecution of Russian occupiers who are responsible for the destruction of the Khan Palace in Bakhchysarai.